Transformed.. wasn't sure as I always try to stay original..
Diamond cut alloys with clear lacquer now gloss black. See you at Hermiston 9am! X1 Where abouts at Hermiston Gait are we meeting ? Im told by the dealership the car has to be returned to Lotus for up to 4 weeks so that Recaro can rectify the issue. 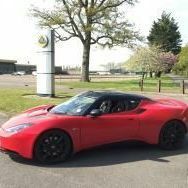 Problem is.. mine is a daily use car so will Lotus provide a courtesy car?? Mm.. Unless its loose seat related. Then its back to the factory job. Quoted as 4weeks as issue is sorted by Recaro engineers not Lotus directly according to my local dealership.. awaiting a call as confirmation and a courtesy car!! Least u get all the sausages ? Made it out of the garage but not down the single track road here and bottled it! Snow coming down so sadly not going to make it. Apologies and well done to those who made it..
Not so uncommon it would appear. Same issue here! Dont know but metallic not mentioned.